Traiskirchen’s cultural life gets very busy in autumn. More than 50 events are a window into the city’s rich cultural and artistic diversity. The opening of the Traiskirchen culture days is the festive kick-off into a variety of art exhibits, theatre performances, music programs, comedy nights and other cultural activities. The opening celebration included live music from the young guitar orchestra “Music for fun” and eclectic speeches from Traiskirchens Major Andreas Babler and Austrian Singer and Songwriter Birgit Denk. 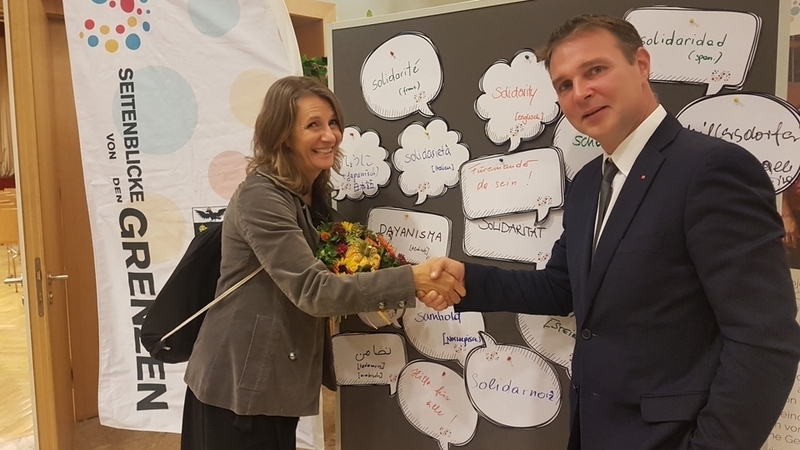 Mayor Andreas Babler spoke of the importance of respecting our differences, finding a common approach to the challenges we face and engaging in a solidary dialogue. For him, one of the greatest achievements of culture is the fact that we live together in peace. And he cited Red Cross founder Henry Dunant, whose words remain as true today as ever: “To help, without asking whom”. In her keynote, Birgit Denk addressed the important role language plays in creating a sense of identity. She pointed out the idea of language in transition: many of the terms used in our language derived from different languages and were naturally integrated into the local dialect. Just like people who have come from different cultures and have found a home and an identity. At the Snapshots Info Point we gave information about the project and invited people to reflect upon the term of solidarity. Which other words or paraphrase do they know? What is it called in a different language? What is the concept of solidarity? Our board with speech bubbles filled up quickly. The event was a good opportunity to discuss what solidarity means and how solidarity can be lived on a daily basis.